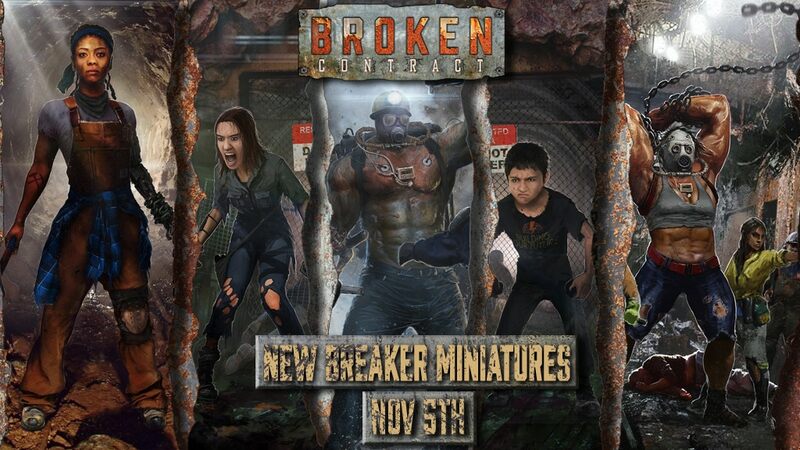 Kickstarter for New Breaker Miniatures Launches November 5th! 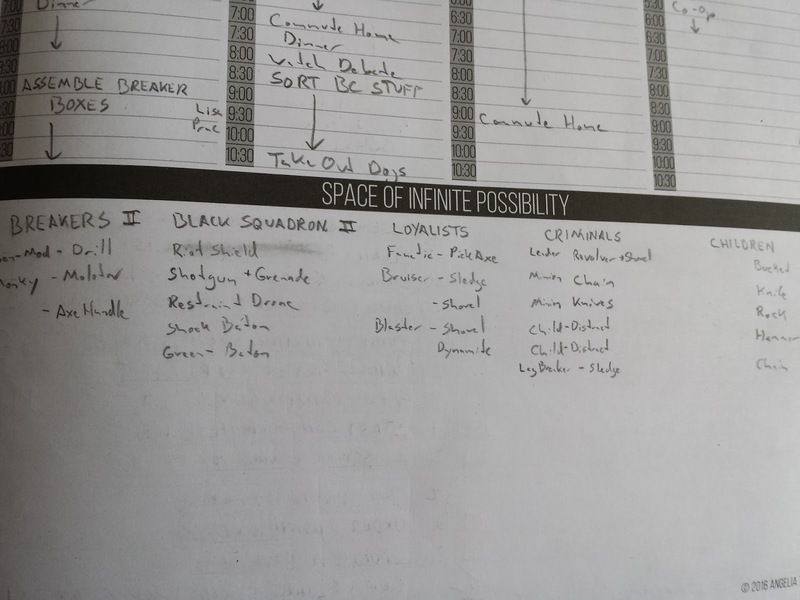 The most frequently asked question I had at AdeptiCon was, "where do you see the story going in the future?" and when probed most people were trying to find out "what other factions do you foresee?" This is a tricky question from a designer's perspective because we tend to have a multitude of ideas swimming in our heads but limited resources to carry them out. You don't want to finish running a demo, get someone interested in your fledgling game, and then prattle on about your ideas for "x", "y", or "z" faction and have them waiting until "z" faction comes out to get into your game, particularly when "z" faction may take years to come to fruition. Six months into this project I already had factions in my head for Season 2, Season 3, and beyond. Two years have passed since then and I still haven't launched Season 1. Design, development, and funding take time so launching into a dozen potential factions can be more of a pitfall than a boon. Still, you want to demonstrate that you have vision and plans for the future, so let's look into the notebook. The opening image is from late last summer or early autumn. It was one of the later iterations of what I saw for the near future of Broken Contract. 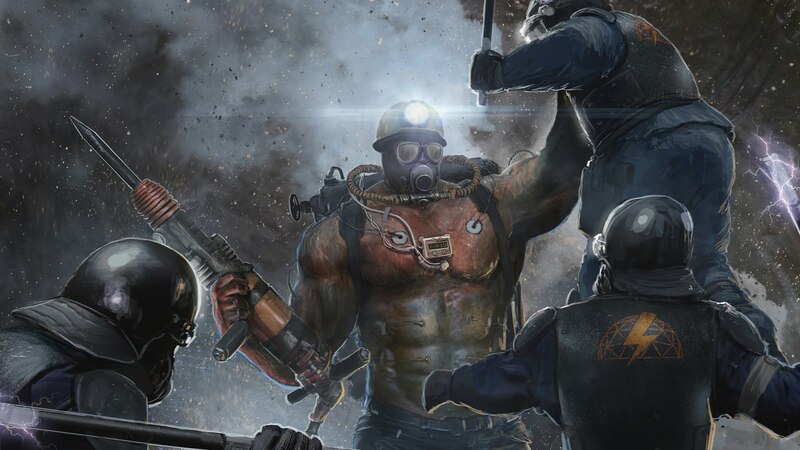 Originally, I envisioned the FerrumSky campaign being exclusively about Breakers and Prods, the rioting freedom seeking miners vs their security officer oppressors. As I created characters based off of common archetypes and tried to give them some depth and complexity, factions just naturally started to emerge. The original cast of Breakers included the criminal, Nells Turnbull, and the Progen, Talla Kellerman. There was also the yet to be seen fanatic, Ned Forsythe. Here I was, creating this group of characters who could work in conjunction with one another, they clearly had other loyalties that I could tap into. Just in these three characters we had ties to a criminal underworld, first generation colonists, and zealous cultists. Here, I wasn't planning for more factions until future seasons yet the microcosm of the FerrumSky mines was spawning them organically. 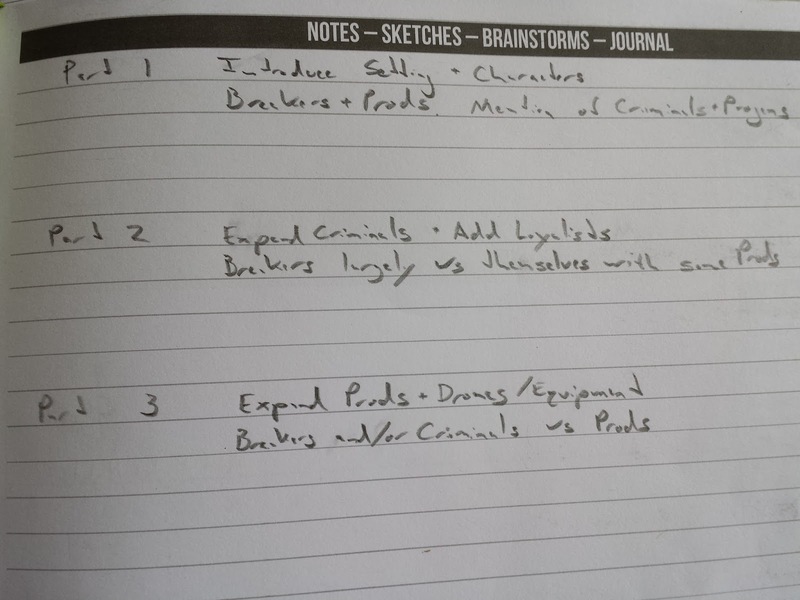 With additional depth developing I started to build it into the structure of the expanding storyline. If you backed the Kickstarter and have models in hand, you already have seen evidence of this first stage of the plan. Those two faction sets introduce a small cast of Breakers and Prods, and Nells and Talla introduce the concept of Criminals and Progens. Part 1 will set the scene using the characters from the two existing factions, and give scenarios and background information to support game play with these characters while setting up the next part of the story arc. Not everyone in the FerrumSky mines yearns for freedom. And not everyone who wants to be free does so out of some ideology supporting liberty for all. Some folks thrive in the established order, others just fear change, and others just want to shift themselves from prey to predator. In Part 2, as the Breakers work their way up through the mines they discover that they are not all on the same page and that their loyalties are divided. Perhaps Nells vies for power within the group? Or maybe they stumble into miners who despise the disruption of these mini rebellions, and would rather beat the Breakers back into submission than assist in their press toward freedom. To that effect, Criminals and Loyalists move to the limelight as antagonists, while still maintaining the impending threat of the Black Squadron crackdown. The FerrumSky Campaign culminates in the final explosive clashes between the Breakers or their Criminal counterparts and a much better prepared Black Squadron Security force bent on quashing insurrection. Additionally, more variations of heavier drones are introduced to reinforce their efforts. Part 3 focuses on the end game - getting out of the mines or getting crushed under the weight of the might of the Black Squadron. The handful of successful Breakers who make it out into the Bonelands are set up for Season 2. This wouldn't herald the end of the FerrumSky mines, it would just allow us all to explore more environments, rivalries, and situations. 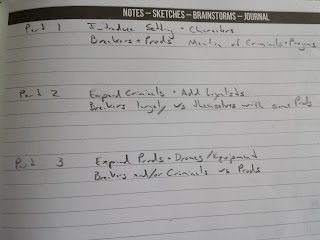 Back in February, I jotted down these notes. In addition to knowing that I took out my dogs at 10:30pm some point during midweek you can also see me working with some ideas for future box sets. The above mentioned framework for more factions actually allows them to be released at an achievable pace while simultaneously giving depth to the initial story arc. New Breaker, Black Squadron, Loyalist, and Criminal characters can each be introduced, along with some new pieces of equipment. These are just notes at this point, but if you are reading this you probably want to see mining drills, molotovs, and restraint drones right? 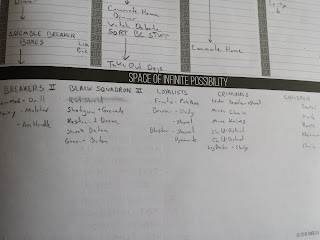 Over the next couple weeks I will further flesh out these future box sets, outline the character's names and stories, map out their Equipment and Ability cards, and start requisitioning art. In fact, I just got the first draft of a new security officer based on one of our Kickstarter Backers and I think he's going to make a fantastic model for the game! However, if the FerrumSky mine story arc is still too "near future" to you and you want a hint of what life is like outside the mines, check out Epilogue: Life on the Run on page 20 of the Broken Contract Background Book for some idea of what lies ahead. As always, thanks for reading and sharing your thoughts is encouraged. Thanks all! Last year I started a Dungeon Crawl Classics group with my friends. For those that don't know, Dungeon Crawl Classics is meant to be D&D like it is 1975, and touts the catch phrase, "Deadliest Game Alive". During Character Creation one of the characters in our 0-level funnel came up as a herder with a herding dog. The dog, Fetch, has outlived their herder master, and became a beloved Character in a very lethal game. Not surprisingly, the players pushed for Fetch to have the ability to advance. Here is the first draft of the rules if you are interested in my take on Canine Player Characters in DCC. You’re running a 0-Level Funnel for a group of players who are all dog people. One of the Characters comes up as a Herder with a Herding Dog, and before you know it, the dog is the most cherished member of the party. Treasure be damned, as long as the dog survives! Kickstarters You Should Know About! I have a lot of friends doing a lot of cool stuff. One of those friends has a project that is currently on Kickstarter. It is called Ruin & Conquest and it is a system-agnostic campaign setting for whatever fantasy RPG you love. Brinton Williams has thrown his heart and soul into this tome and has gathered a whole host of top notch analog artists to bring his vision to gritty black ink on white paper. Go over to Kickstarter and check it out. The funding push will end on Friday October 26th, so don't sleep on it. Also, it looks like his Facebook group could use a boost too, so if you're on Facebook go Like Ruin & Conquest there. Art by Nerdgore The concept of a Player Character with outdoor skills has firm footing in fantasy literature, but not every solitary woodsperson is a benevolent ranger. There is also the survivalist hunter, and the thieving brigand roaming the hills and forests. The Outlier emphasizes the varied motivations and skills of those that live off the land, whether they seek to protect it, or take what they need from it, outside of the governance of “civil” society. Thank You Attendees of AdeptiCon2016!